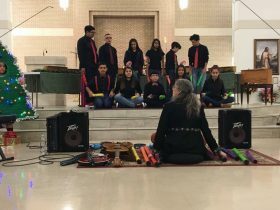 With over twenty years experience as a teaching artist, and over a thousand students passing through her school classroom and private music studio, Lisa Markley remains as passionately devoted to teaching as she is to writing and performing. Private lessons and workshops are available in voice, piano, composition, songwriting, guitar, audition preparation (ear training, sight singing, music theory) and even trombone. Lisa is a graduate of the University of North Texas’ renowned School of Music where she studied composition, jazz, voice, piano, trombone and music education. I strive to honor the journey of each child, this includes those with learning differences. There is, at the very heart of what we do in the music lessons, a joy in the making of music. 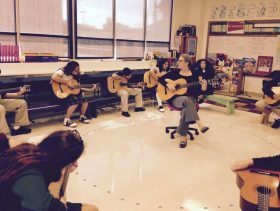 Students must feel that the lesson space is a safe place to take musical risks , to make mistakes, to ask questions , and to try again. 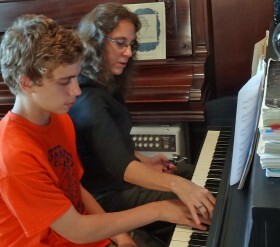 I teach the whole musician, specializing in beginners (ages 6 to “grownup”). The voice is an integral part of study, even when the main focus is instrumental. All piano and guitar students sing what they play. Vocal students are expected to study piano as part of their voice lessons, (if they are over the age of thirteen, they also have the option of studying guitar). Piano is the ideal first instrument! A good working knowledge of the piano is an excellent first step towards all the other instruments. In our music lessons, proper technique and knowledge of music fundamentals grow alongside improvisation, chord theory and playing by ear. I do not adhere strictly to any single methodology though my own teaching method has been greatly informed by the techniques of Zoltan Kodaly and Carl Orff. Lessons are customized for each student. The basics of music notation and Western harmony can be learned through any musical genre, be it classical, blues and boogie, jazz, pop, country, or folk styles. I seek to find music that truly inspires each individual student. Composition and songwriting are highly encouraged.